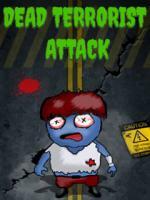 Dead Terrorist Attack is #1 addicting and entertaining fun play for java phone! Smash all zombies in fun great action game! Highly entertaining for kids, boys and girls and for all age people. Interactive Dead Terrorist Attack game play with special virtual goods that make the game easier for young new players can be acquired! Dead Terrorist Attack is so simple but so addictive, just experience this super killer bug invasion! Go, have fun with Dead Terrorist Attack. Download Dead Terrorist Attack now.